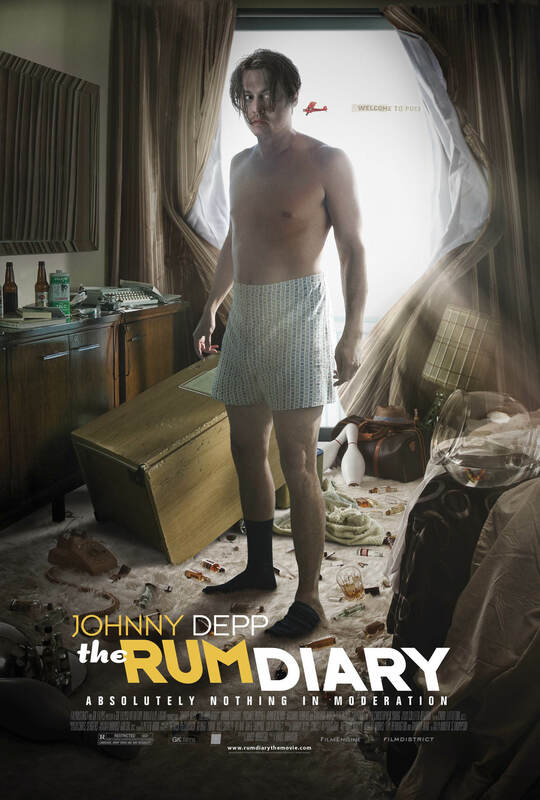 Badly paced and lacking in energy, The Rum Diary sometimes glimmers with potential, but soon flops again. This should be a wildly energetic, sharply focused, and beautifully shot movie that’s full of wit and clever observations. The wild characters should be more engaging, the story should zip along, and frankly I should come out of this feeling something more than just mildly bored. The film is clearly well intentioned, but no matter how much it tries to capture some of the necessary energy for this film, it far too often just seems to be treading water. Johnny Depp gives a passable performance; it’s not amongst his best work, but it does gain bonus points for being much more restrained than is expected of the actor nowadays. Amber Heard demonstrates her talent here but is cut short of giving a great performance by the script’s limitations, and surprisingly it is Giovanni Ribisi who is the film’s standout actor – however his character doesn’t have loads to do, and therefore can’t save the film. You see, The Rum Diary is largely an example of decent material and potentially great performances, which are never given the chance to really shine. It’s all just a little restrained, a bit crazy in places for the sake of it, and then it quietly just fizzles out. I can’t say I recommend this one, it wouldn’t be a complete waste of your time if you wanted to give it a go. It looks nice, there’s a couple of somewhat compelling stories within it, and there are several good jokes to help it along, but you can do much better than this generally. Really it’s only for the Hunter S. Thompson fans amongst you. It’s heart is in the right place, and so are Depp’s efforts, but it’s Ribisi who comes out best. It takes too long to get going, and when it does it still meanders – it’s the script that’s at fault here. Not really. There’s nothing here that would draw me back for a second viewing. Let me know your thoughts by typing out a comment below! I have been meaning to see this. Now maybe I’ll be less anxious. Well still see it if you’re interested, just don’t rush out for it I would say! Nice review Rumsey. Pacing issues aside, I just had a problem actually believing Depp as young, starting-up reporter, even when he was banging the sweet heavens out of Amber Heard. Good for him since he’s doing that in real-life, but damn, was it hard to watch the scenes between them both. Thank you, Hah I know what you mean! I think knowing that they are together in real life made me not struggle as much when watching them together on screen, but yeah, it was somewhat hard to believe. Nice review man. This is one I kept saying I may go back and catch. But then I would ready another bad review and would back off again. Hey Keith! Thank you, it’s not horrendous, just disappointing really. You might as well catch it some day, but don’t rush to it! Thank you Zoë, ah so it sounds like some day you’ll be forced to watch this, regardless of how interested you are! No I haven’t read the book unfortunately, and I now won’t be rushing out for it either – although I have been assured that the book is much better than the film. I might have to, sheesh! Hunter S Thompson is a great writer, so forget anything you saw in the film, the book will surely make up for it! Haha, I’ll do my best to forget it! Maybe I’ll read the book and then better appreciate this film! That’s interesting how your opinion has changed so much over time. I agree that if it were shorter, and a hell of a lot more focused then we could have had a great movie here. As it is though, it’s just disappointing, especially as it’s heart is clearly in the right place. Good decision my man! She isn’t in it too much either really, so another reason for you to skip it! I’ve always meant to watch this but haven’t got around to it because I hear it’s pretty crummy. Loved the book, though. I haven’t read the book, so I can’t compare them. But this was just flat, badly paced, and lacking in energy, which I assume the book wasn’t? The book isn’t some fast-paced thrill ride or anything, definitely nothing like Fear & Loathing in Las Vegas, much more straightforward, but interesting. Uh huh, that’s kind of my sense of the book judged on what I had read. It would be interesting to know your thoughts on this adaptation actually if you ever watch it. This is at the bottom of my list of the films I watched this year. Just soooo boring. It really could have done with a jolt of energy to liven it up couldn’t it! However I do think there is a good film buried in there somewhere. Not one that appealed to me and got a real lambasting by the critics. It was the director that did Withnail and I right? Even more reason to be disappointed. It was indeed. It was a real disappointment and I wouldn’t recommend it to anyone other than diehard Depp fans! Do you think he will get his career back on track? I would like to think so as I actually really like the actor he used to be but he doesn’t seem to be heading in that direction at all at the moment. What do you think?